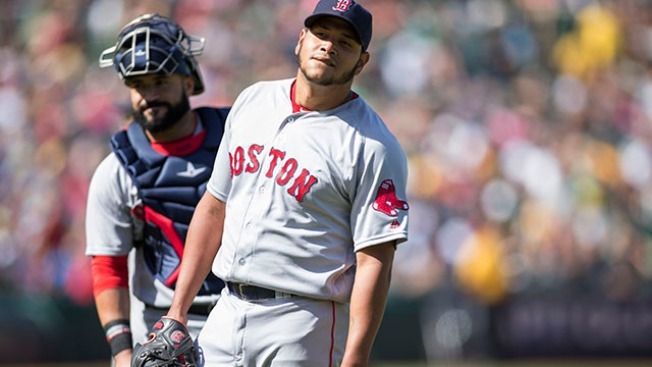 Red Sox left-hander Eduardo Rodriguez has been put on the 10-day disabled list after injuring his knee on a fall from the bullpen mound. Rodriguez slipped off the mound during the latter stage of his warmup for Thursday night's start against the Baltimore Orioles. He declared himself OK, but ended up allowing a career-high tying four home runs in Boston's 7-5 loss. "I just threw a pitch and my foot landed in a bad position. I went down. Nothing crazy," he said. Rodriguez had won four straight decisions before Thursday's loss. He's 4-2 with a 3.54 ERA in 11 games, 10 of them starts.